This incomparable energy allows us to find the place in life that is meant for us, as Christine Arana Fader, the ‘dragon woman’, powerfully shows with these entrancing stories from her daily life. Granting us a glimpse of the mystical world of dragons, she will help us to get to know our own dragon, a close personal companion who will share its invincibility, its wisdom and its magic with us. ...and you will grow as a person and find your own path. In 2000, Christine Arana Fader was introduced to the dragon’s energy by the spirit world. Over a period of ten years the beings of light and dragons instructed Christine, leading her to give meditative dragon trance journeys and dragon workshops. "Are you ready to put a little magic back in your life? 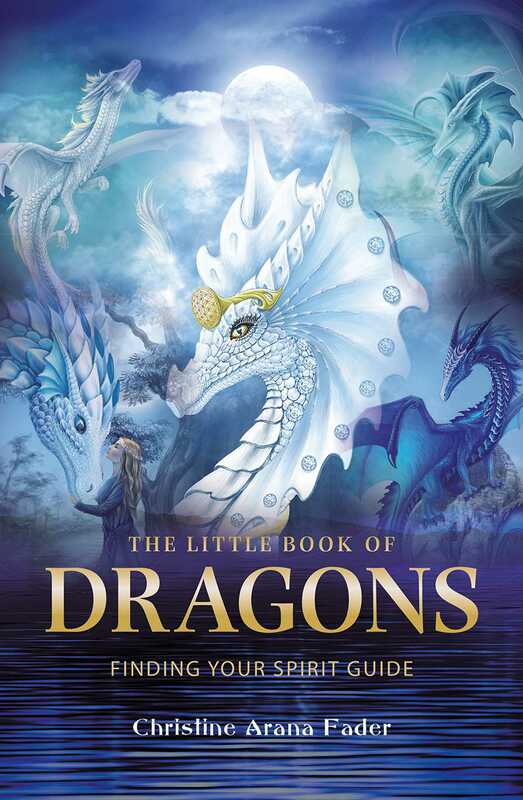 In her new book The Little Book of Dragons: Finding Your Spirit Guide author Christine Arana Fader takes you on a journey to glimpse the mystical world of dragons. The dragons and the dragon riders are returning. With them they bring the old values of courage, loyalty, true friendship, companionship and the knowledge that you are not alone. Both fascinating and fun, The Little Book of Dragons describes a world filled with many different kinds of dragons. Aided by gorgeous illustrations from Anja Kostka, she introduces us to The White Dragon, The Black Dragon, The Silver Moon Dragon, The Pink Love Dragon, The Green Emerald Dragon and many others. Fader believes the dragons are coming to watch over knowledge, banish fear and to take care of us. She encourages the reader to heed the dragons’ call and bring your personal dragon back to this life. After all it has been waiting for you for millions of years. The Little Book of Dragons contains a trance journey designed to help you discover your particular dragon and to become the hero of your own legend." "In this book, Christina Fader captivates readers with stories from her daily life. Known as the 'dragon woman', she shares with readers the magical powers of dragons and encourages readers t develop a relationship with their own dragon. Once we get to know our spiritual dragon, Fader explains how those companions will sure their gifts of strength and wisdom." "Christine Arana Fader’s book about DRAGON MAGIC leads straight to the very soul of magic. This book is equally impressive and enchanting, as it conjures the amazing power within Dragon lore. I would wholeheartedly recommend it to anybody who wishes to find a Guardian of this nature, those who know the wisdom of the Cosmos. For the souls that seek to be a Dragon Rider are the oldest of the old, with a divine wisdom that has existed since the beginning of time. This book awakens that special knowledge!"